A little known fact is that over 25% of all orthodontic patients are adults. Common adult concerns include a single out of place tooth, a gap in between your teeth, crowded teeth, or how your bite feels in the back. Although not as visually noticeable, the way your bite in the back functions is just as important as how your smile looks. People are living longer than ever, and a proper bite plays a huge role in maintaining your teeth until you are 100 years old! These are all valid reasons to pursue treatment, and we would be glad to review the treatment options available to you. Many adults are drawn to the “invisible” options of treatment- these treatment options include clear ceramic braces, Invisalign, and lingual braces. With aesthetic options available to you, you no longer have to endure traditional braces to achieve a radiant smile. Not only are these options aesthetic, but they can be more comfortable than traditional orthodontic treatments, require less maintenance, fewer office visits, and shorter appointment times. 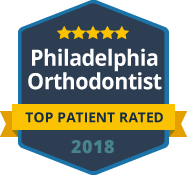 Dr. Neil and the Broad Street Braces team have extensive experience treating adult patients. We will work in tandem with your general dentist and any other specialists, including oral surgeons, periodontists, or endodontists, that your treatment might require. We will make sure that your specific concerns are addressed, and when your treatment is complete, you will be proud of your smile and your investment in your dental and overall health.